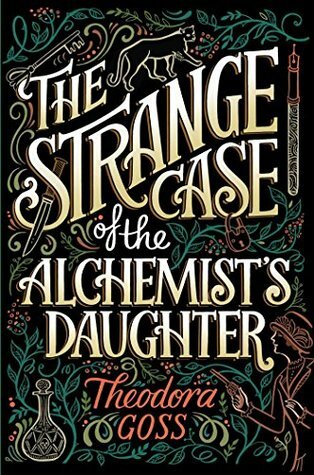 I’ve only read Hardinge’s two Mosca Mye adventures Fly by Night and Twilight Robbery previous to this, but from them I got the definite impression that she is an author who loves language and history, who’s irreverent, generous and nonconformist. Certainly an author I want to read more of. I’m extremely picky about the YA fiction that I read because most of it is such twaddle (love triangles, sparkly vampires and the like not being my cup of tea at all), but Hardinge is just fabulous. 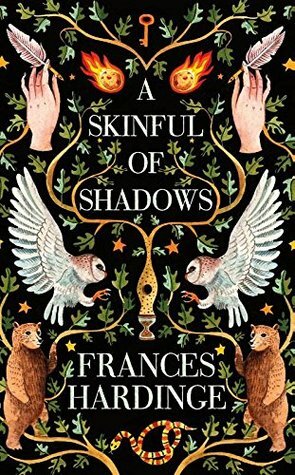 A Skinful of Shadows is a less gleeful tale than those of Mosca and Eponymous, but it is still gorgeously told, and this time rooted very firmly in the beginning of the English Civil War. It deals with themes like inheritance and power, doesn’t shy away from critiquing the concept of aristocracy or pointing out that both political and religious beliefs can cause a lot of damage, and fiercely champions the underdog. If you’re an animal lover there are several scenes that will give any faith you have in humanity a hearty kick in the balls, so there’s a big fat trigger warning right there, but Hardinge also gives us an incredibly compassionate and feisty heroine in Makepeace Lightfoot. And, of course, she’s written a really very creepy ghost story that successfully freaked me out in a couple of places (not that that’s difficult to do as I’m a huge wimp, but I can still identify quality chills from cheap scares and this is the good stuff). The plot is fairly dense, but roughly speaking it goes a little something like this: Makepeace’s mother has gone to great lengths to keep her daughter away from her father and his family, and to prepare her for her uncanny paternal inheritance. Because Makepeace can harbour multiple ghosts within her mind, and her father’s family, the aristocratic Fellmottes, use this ‘gift’ to preserve long-dead members of their family in a deeply creepy and not-a-little vampiric practise that most often destroys the mind of the host. In what is going to sound like a very disparate series of events, after her mother dies in a riot Makepeace accidentally takes on board the ghost of a dancing bear, then gets shipped off to the Fellmotte’s ancestral pile at Grizehayes. Here she meets her half-brother James, another by-blow, and … dark and twisty adventures ensue. She is his protector and he is hers and through one another they achieve a peace they may not have got to on their own. Which is just as well because being part of the Fellmotte family, even an illegitimate one, is enough to destroy any peace of mind you ever had. Forever. From her first meeting with Obadiah, the head of the family, Makepeace (and Bear) know that something is very very wrong, a feeling that is only compounded with every new bit of information – none of which I plan to share with you. 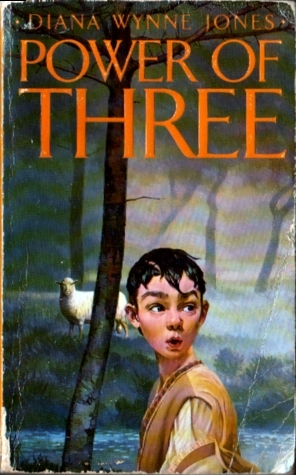 It’s safe to say Sir Marmaduke is terrifying in the orchard, Lady April is consistently unsettling throughout, Sir Thomas becoming the head of the household is not good at all (poor Sir Thomas), and Symond is no better than the rest (which is the understatement of the year). Running away is scarier than staying put, staying put is a special kind of scary on its own, and when the protagonist feels that she has more in common with the geese she fattens up for slaughter than with anybody else in the household … well … you get the idea, it’s pretty scary altogether. But Makepeace isn’t one to go without a fight, nor does she believe that just because something has always been done it always should be done. The historical setting is perfect for the story where this conflict between the old and continuation (the Fellmotte Elders) and the young and change (Makepeace and James, and Symond, sort of) is being acted out on a much grander scale within the country. The English Civil War is a fascinating period of history in its own right, as the country struggled with religious and political concepts that shaped everyday lives, and Hardinge does a beautiful job of bringing this world to life, incorporating both commonplace details and some of the more curious facts; a few of my favourites being the gold smuggled into the King’s Oxford court via barrels of soap (he had a whole network of laundress spies – so cool! ), women cross-dressing in order to fight, and some fantastic medical practices such as putting someone’s head in the mouth of an oven to cure their melancholia and squirting some sort of beetroot concoction up their nose to “cool the cauls of her brain” (which puts me right off time travel, I have to say). Hardinge’s prose in A Skinful of Shadows is very different to that of Fly by Night and Twilight Robbery. The language is … plainer, somehow, and I wonder if this is because she is writing about a real historical period, with all the obligations that entails, or because it is a darker story in which some of the play of her other books wouldn’t quite fit. Whatever the reason, it is still beautifully written and there are glimmers of something richer occasionally, some lovely bits of vernacular (favourites: “selling them a tarradiddle” – telling tales; “soft-headed little doddypoll” – an insult, naturally; and the beautiful “chirurgeon” – an early form of the word surgeon) that comforted me when I worried that maybe Hardinge was moving away from that language-love I associate with her. 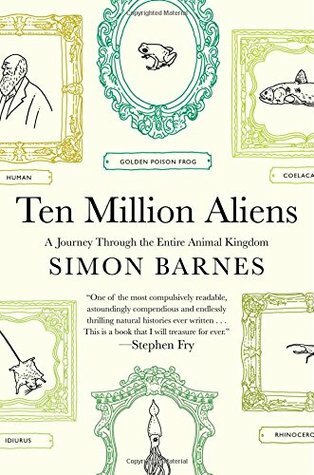 There’s loads to love about this book that I haven’t mentioned. I could spoil so much. Suffice to say, some books are roughly the same kind or awesome for everyone who reads them, whereas others will mean different things to different readers. And this is the latter kind of book. The things I loved about this won’t necessarily be the things you love. You may not care so much about the turnspit dog (although if you don’t I’ll want to know why), or notice the significance of the various names Makepeace uses on her journey and how she grows into the name that “made her feel a bit unreal” way back at the start of her story. Instead you’ll notice things I completely missed and care about different things. The important thing is that you read it and see for yourself. I heartily recommend that you do. If you see something entitled Six-Gun Gorilla you buy it, right? Of course you do! It doesn’t matter that you don’t know what it’s about. I mean, you notice that it’s by Simon Spurrier of 2000AD fame, so you know your brain is gonna love it. And the artwork is by Jeff Stokely, so you know your eyes are gonna love it. But, and I may have mentioned this already, it’s called Six-Gun Gorilla for Pete’s sake! What more do you need? 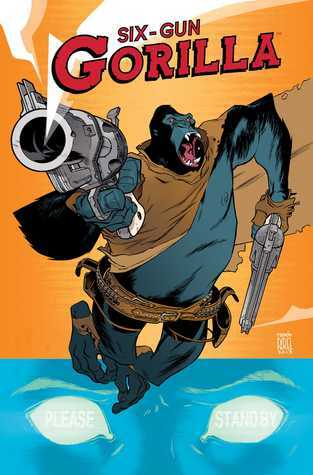 Six-Gun Gorilla is a graphic novel about an ex-Librarian, a gun-slinging gorilla (obviously) and a future in which the obsession with reality TV has cranked up a couple of notches. All “Blue” recruits heading into the ongoing battle with the rebels of the Blisterstate have a “psychic tumour” implanted in their head so that the paying audiences at home can experience everything that these recruits (for which read: cannon fodder) go through. Replaying the ‘best’ deaths of the day is a feature of this new entertainment, and, because it’s all about the money, adverts run constantly. Viewers at home immerse themselves with viewing helmets, or if out and about, a TV visor. The Blister, in/on which most of the action takes place is a minor miracle of world-building. It’s never 100% clear whether it’s another world entire, another dimension, or a limbo between dimensions; or even if it’s real or imaginary (not that there’s not plenty of information thrown in, I just feel like you’re supposed to decide for yourself), but it’s beautifully rendered by Spurrier and Stokely and as important as any of the characters. Electricity and combustion don’t work within The Blister which leads to some interesting swap-outs: Giant tortoises act as personnel and heavy artillery carriers, mutant ox, horses and, in one instance, bicycles, are used for transport, guns are clockwork or pneumatic, there are some odd psychic weapons like choirshot and psi-blockers, and then there’s the titular gorilla’s two six-shooters … wait a moment … that shouldn’t work, and yet, they do. Then there’s the weather: prehaze, blisterquakes and the blaze, all as dangerous as they sound; and the local fauna, the tumblesquid, creatures made from the substance of the Blister itself, and seemingly sentient. The Blister reacts to the people fighting over it, emotions manifest physically in the environment and this leads back to those interesting thoughts about what The Blister might actually be. It’s all pretty awesome. But there’s more. Blue-3425, the ex-Librarian now foot soldier for the Blister Expeditionary Forces, may be on/in The Blister, but his story is very human and recognisable, a story about love and sorrow, and the importance of memory. The Blue recruits, A.K.A. “holeheads”, are suicide squads, people who don’t want to live, criminals from death-row, or people who have terminal illnesses that choose to go out with a (non-combustible) bang in the colonial wars rather than commit suicide, wait for their fatal injection, or sicken and die slowly. Our Blue has lost everything, his wife, his house, his car and his job and signed up out of despair. 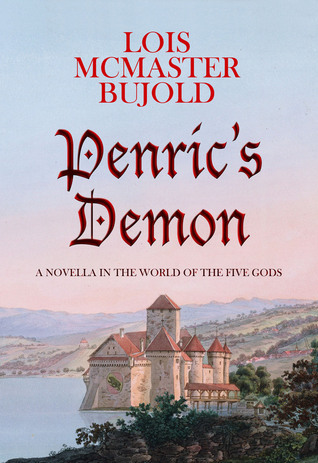 In his previous life, he worked on and was obsessed with old pulp stories, living more in stories than out, which eventually cost him his marriage. As he gets drawn into events in The Blister he and the mysterious gorilla he meets out in the desert discuss the nature of stories, while fighting off a great many people who are trying to kill them both. To say more would ruin a lot of the comic’s surprises (and there are some kickass surprises in store), but I can throw out a few teasers: Blue-3425’s ex-wife Sue plays a part in the over-arching plot which is deeply satisfying; hired killer Auchebran is hilarious and disturbing in equal measure; the tumblesquid creatures are utterly awesome – I could have stood a great deal more of them; and the gorilla gets all the best lines. Finally, at the end of Blue-3425’s story, I cried … and if you don’t feel just a little choked up when you get there then I suspect you’ve had something removed. Probably your soul. Humans are all about stories. We tell them to ourselves and to everyone around us every day, we look for them in all things, use them to explain, encourage and persuade. And we hunger for stories. It may ‘only’ be a graphic novel, but Six-Gun Gorilla looks at that hunger, looks at how stories are both empowering and humanising, and how they help us make sense of our lives. Whilst also making full use of a cloaked and gun-wielding gorilla badass. Six-Gun Gorilla was originally a comic from the 1930s that appeared in Wizard magazine. You can find out more here, if so inclined. Dystopian fiction often removes or adds one simple thing that tips the balance of society toward the bad. In Vox that simple thing is women’s freedom of speech. Every woman in Dalcher’s near-future America has been fitted with an electronic word-counter and has a quota of only one hundred words per day. Books, paper and pens are denied them, as is work outside the home. Female children are educated separately to males, and only in the skills needed to run a household and keep a husband happy. Women can no longer hold passports. We learn all of this from the POV of Jean McClellan a former doctor of neurolinguistics, now a reluctantly quiet housewife who laments how quickly all this happened and how little she did to protest against it. 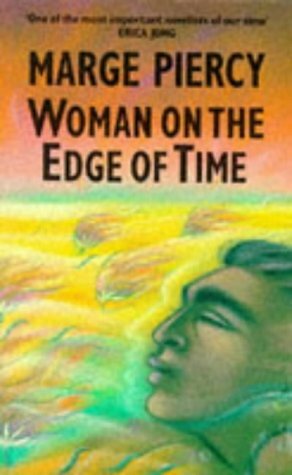 If the book had continued to explore how this new world came about (there’s a lot of heavy hinting that Trump’s election was the first step down this path), and the dreadful consequences it has within Jean’s reduced and domestic sphere it could have been a really uncomfortable, thought-provoking experience. I mean, I was positively squirming as Jean watched her eldest son Steven fall hook, line and sinker for the new ideology and became truly hateful towards her, spouting crap about who should buy the milk and wearing his little self-righteous ‘P’ pin (‘P’ for Pure, don’t cha know), while her six-year-old daughter Sonia willingly, happily became silent, not using even one of her hundred-word daily quota. Instead, after a pretty tense set-up that I was starting to get into, this book went all kinds of wrong. Firstly, it became a thriller, which is a very different beast to a dystopian thought-experiment. Thrillers are all about getting to the end, but they don’t worry so much about the hows and whys of things, and while Dalcher proved very capable at writing pacey, race-against-time action, it meant that any thoughtfulness, detail and plausibility had to be left behind. Secondly, none of the characters developed any kind of dimension. Jean had a fairly distinctive voice (although I’m afraid I never warmed to her and just couldn’t picture her in my mind’s eye), but her husband Patrick remained a bland paper person, her twin sons Sam and Leo were nothing more than names throughout the book, and her lover (bleurgh!) Lorenzo was a blatant stereotype: the passionate Italian hunk who makes Jean weak at the knees with just a look (yep, I kid you not). Thirdly, the ending removed all the complexity, moral ambiguity and interest from Jean’s situation. It was a wave-a-magic-wand ending in which one act completely overturned both the political and the personal stories of the novel in the most irritatingly heavy-handed way. That said, I found it interesting that Mira Grant’s scary, face-eating mermaids having language made them far more terrifying than if they’d been uncommunicative in another of my recent reads Into the Drowning Deep because somehow it meant they were more intelligent in a way we could understand; interesting that taking language and literacy away from anyone is almost immediately reductive, closing that person/people off from ideas, expression and connection (there’s a pretty interesting article by Ryan Britt at Tor.com about illiteracy in the Star Wars universe that is kind of floating around in my mind as I write this – worth a read if you’re interested); interesting too that David Crystal talks in his book about just how early on children start to learn language, how we are predisposed to do so, and just how complex the mechanics of talking are; interesting that in Vox Jean remembers a discussion with a younger Steven about dancing bees and Koko the gorilla and whether these examples of communication are proof of intelligence on a level with our own. I might not have enjoyed Vox as much as I’d hoped to, but it’s left me with a lot to think about nonetheless. Why is it called Vox? 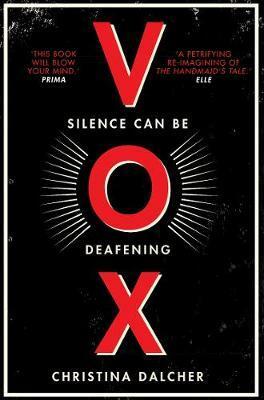 I thought maybe it was a portmanteau word – Voice + box = vox. Suggestive of a voice being put into a box, thus contained and controlled. I didn’t really know. Now a quick Google search has informed me that ‘vox’ is a music journalism term for vocals, or voice. I liked my reasoning better, but still, that’s me a little more educated, and maybe you too. 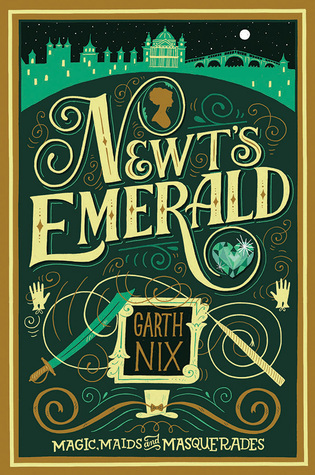 So, Garth Nix inspired by Georgette Heyer + Regency + Magic? = AWESOMESAUCE! This was marvellous fun. I read it in a day. Then I read it again. (I can’t tell you how happy it makes me to be able to type that after my December reading doldrums!) It has some of my favourite Heyer-ish elements in it: a young woman disguising herself as a man, a feisty elderly relative who’s in on the plan, excellent dialogue (with fabulous historical slang words like bosky, jobberknoll and flummery thrown in), and a satisfying romance that you can see coming a mile off and isn’t made too big a deal of. There’s plenty of adventure and it all ticks along at a nice pace. Lady Truthful Newington, nicknamed Newt by the cousins with whom she played as a child, is turning eighteen and preparing to enter society. Unfortunately, at her small family birthday party a magical heirloom, the Newington Emerald, which she is to inherit, is stolen. Her father promptly falls ill, and so Truthful turns to her Great Aunt, Lady Ermintrude Badgery (top marks for that name Mr Nix!) for help in tracking it down. There’s no particular mystery to solve, but there are lots of misunderstandings and dashing around getting into compromising positions to entertain the reader. And Nix has worked magic into his version of Regency England very beautifully. I particularly liked Napoleon’s fate here, trapped within the rock of Gibraltar rather than simply being exiled to St Helena, and the law requiring that all houses have brooms of hyssop and rue on hand to dispel evil sorcery. I got the same kick out of reading this that I did out of reading “A Handful of Ashes”, which is exactly what I was hoping for. I do have to say just a little more about Lady Badgery though because she’s a work of art. Actually, she needs her own book. She spends a lot of time in her bedroom wearing a large fez and reading letters, but when she goes out on the town she wears marvellously out-mode dresses and carries a sword cane. She is a sorceress of the first order and helps Truthful’s disguise along with a little magic and a great deal of knowledge about male dress (hmmm, suspicious). She’s snappy and funny and has some fantastic secrets. You know how sometimes you fall utterly in love with a character even though they may not be the main one in a book? Well, I’m head-over-heels for Lady Badgery – she’s just fab. Finally, it was my maternal grandmother who first introduced me to Georgette Heyer. She loved historical mysteries and romances, the Temeraire books by Naomi Novik and the nautical stories of Alexander Kent and Patrick O’Brian. She introduced me to Mary Stewart’s Arthurian trilogy, and shared my love of Robin McKinley. We were reading buddies a lot of the time and would both get up early on a Sunday morning and sit at the kitchen table talking about books. In a quieter, less snappy way she was a lot like Lady Badgery. She’d been a Land Girl during the war, had worked hard all her life, was ridiculously generous and, despite all that she had privately been through, she was happy. When I reread Heyer I always think of Nana. And I thought of her while reading this; she would have been delighted by Newt’s Emerald. So when I saw in his afterword that Nix had mentioned Austen, Heyer and Patrick O’Brian were his influences for this book I almost heard Nana’s gleeful chuckle, because I’m now off to investigate this O’Brian chap. Reading Tam Lin is like reading two parallel stories – one a straightforward tale of college life, the other a much stranger and more magical brew. It shouldn’t work, but it does and does it so beautifully that I fell completely in love with this book. The main reason Pamela Dean’s blend of college and magic works so well (and this is something that she captures brilliantly) is that the time spent at university is a time unto itself. Not only is it a transitional period for those who go, it is also cut off from everything before and after it. University is nothing like the home and family you’ve come from, nor is it the working world into which you will subsequently go. It’s a place wholly wrapped up in itself and as such is the perfect setting in which to meet the otherworldly. Blackstock College even more so with its lovingly described campus surrounded by ancient cedar trees and maples and ash, a stream, woods and two small lakes. Even its less beautiful bits, like the ugly shoe-box-shaped Forbes dormitory and the reflective glass box of the Music and Drama Center are affectionately depicted, so that the whole place takes on the aura of an enchanted space. The magic at Blackstock is all seen out of the corner of the eye, or is seen but not understood until later. 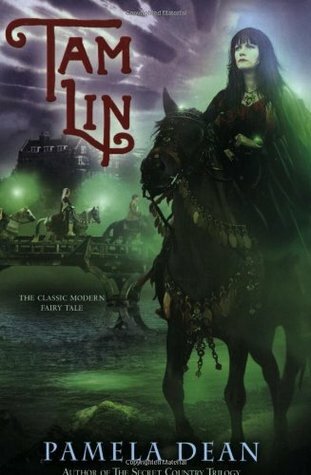 In fact, Tam Lin isn’t a book that can be enjoyed fully on the first read-through. It’s not until the second and third readings that you start to appreciate some of the jokes and more puzzling comments, or really understand the magic that is happening. It’s all worth the effort though: I thoroughly enjoyed all of Nick and Robin’s banter on my second read-through, that on my first I had been mostly confused and annoyed by (who talks like that for goodness’ sake? And when have you ever met a boy who smells of lavender or rue??). I’ve loved everything to do with the Fourth Ericson ghost on all my read-throughs and will continue to do so. The mystery of Peg and Sharon’s bunk beds likewise. And the way that the source ballad’s story is worked into this with its inevitable and much more obvious magic is clever. That Dean is able to do it and not break the reader’s suspension of disbelief (or Janet’s) is another little bit of magic in itself. It helps that all the magical goings on are worked in and around all the oddities and traditions of Blackstock itself. Late night bagpipe playing and horse-riding at Halloween gets mixed up with the hiding of the bust of Schiller and the poetry graffiti in the steam tunnels under the campus, so that none of these things seem strange. Melinda Wolf’s flower and herb wreaths on her door and the books thrown from Ericson that are/aren’t library books become entwined with all the quoting of Keats, Shakespeare, Milton and Homer and the college’s running joke that all Classics majors are mad. Food fights, ritual Pill-taking and performances of Hamlet, Rosencrantz and Guildenstern are Dead and The Revenger’s Tragedy blend with “Thomas’s transformation from a raging maniac to a soft-spoken charmer” and Janet’s inability to think clearly about certain things while at Blackstock. In the end everything is strange, and so nothing is. The characters are just as carefully drawn. Janet is wonderfully pragmatic and poetic, furious and funny, smart and curious. I love her familiarity with Blackstock and the feeling that I am always seeing it through her eyes. I love her roommates Molly and Tina and the relationship that develops between the three over the course of the book. I particularly love Janet and Tina’s relationship because it seems so true to their age and situation. Living with someone other than family for the first time does mean you rub up against different world-views and I think Tina gets a raw deal from Janet, who paints her at various times as the Unimaginative One, the Jealous One and the Ordinary One. Maybe I feel for Tina too because she gets so very confused when Janet and the others all start quoting Shakespeare. I studied English Literature and History for six years and I couldn’t always tell who or what they were quoting, so what chance does poor pre-med student Tina stand? And isn’t Janet really just a bit jealous of Christina for being tall and athletic and able to get up early in the morning and be cheerful about it? The boys Thomas, Nick, Rob and Robin are all a little enigmatic and far too charming to be real college boys; Nora, Sharon and Peg are a lot more convincing both as teenagers and students, and I wish there was more about them in the book. And is it an especially British perspective to think that they are all of them just a bit too smart, a bit too sure of themselves? Are American college students that much more confident and certain of their path than their British counterparts? Or is this the only flaw in an otherwise near-perfect book? Maybe Dean needed these characters to be that much more mature so that they could carry off their performances. Magic and the slightly unbelievable maturity of free-roaming teenagers aside, I loved so many small things in Tam Lin too. I loved the glimpses of Janet’s family and home life, and that the family dog is called Vincentio. I loved the Pink Curtain pact that Janet, Molly and Tina make. I love the Meeb, a.k.a. Amoeba (a.k.a. Pye Wacket). I love that the various theatrical performances Janet goes to see over the course of the book always mark some movement in her personal story. I love that at the end of my first read-through of Tam Lin I had a longer tbr list than I did at the beginning. I love the attention paid to the passing of the seasons and the colours of the trees and the weather. I love all the lavish quoting that goes on. I love that Greek comedy and tragedy have as much place in this book, whose source material is a Scottish ballad, as Shakespeare does. I love that on her bedroom door at home a younger Janet painted the legend “Say ‘Friend’ and Enter”. Dean’s version of faerie magic in the mundane world is wonderful. The flirtatious way in which this magic moves through the book, glimpsed from afar, its presence almost always felt more than seen, is so much fun to read. This is a book about books and college, about friends and lovers, about the mysteries and decisions of life. It’s a book that gives more up the more times you read it. 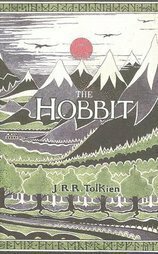 It’s the kind of book that makes you look for magic. ‘I’m afraid so,’ said Nick. ‘I started when I was young, you know, and never got out of the habit’. You know how it is, you fall in love with the cover of a graphic novel sometimes only to find that the work inside doesn’t live up to your expectations. It’s difficult to buy comics online because of this. You just don’t quite know what you’re going to get and when the artwork is as important as the story, that matters. 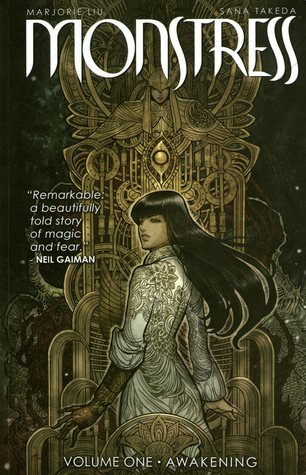 So when I saw the sumptuous cover art for Monstress: Awakening online, I didn’t get too excited. But open this book at any page (as I did in a Birmingham book store before Christmas) and Sana Takeda’s utterly gorgeous artwork will bewitch you. Entice you. Enthral you. (Too much? Too bad – I’m not even started yet). This is the best looking graphic novel I’ve seen in all my thirty-nine years, and sure, looks aren’t everything, but damn, they can pack a punch nonetheless. Despite its gorgeousness, this is no cutesy fairy tale. On the back inside cover Marjorie Liu writes about her grandparents’ experiences of war in China, saying “In their stories surviving was more horrifying than dying”. If one sentence could sum up Monstress it would be that one. This is a story of surviving horrific things done for horrific reasons. Liu has created an epic heroine in Maika Half Wolf, survivor of war, incarceration and maiming, who is driven by both the mysteries of her past and a barely contained anger to infiltrate one of the strongholds of the Cumaea, the powerful witch-nuns who have recently risen to rather dangerous heights. Ostensibly that is the gist of this first volume. However … yeah, wow, however … Liu isn’t just telling a one-stranded story. She slowly, slowly builds up her picture of a decadent society in which multiple inter-related races share a long and troubled history. This is a world where the old gods still haunt the landscape (there are a couple of Princess Mononoke moments), where powerful relics still exist, where forgotten history is treacherous. The layers are incredible. And the various agendas are equally complex. We have different races all with different views on the various events of past and present, we have different religious groups working against one another according to their various beliefs. We have spies and people-smugglers, slave-traders and soldiers. Pretty much every character you meet within these pages has multiple secrets and cannot be taken at face value. The only character who can apparently be trusted is the adorable young Kippa, and even then I wouldn’t put any money on that statement. Kippa, I want to believe you’re good … you delightful slice of cuteness you. I’m being as careful as I can not to give too much away here because I really think anyone with an interest in comics/graphic novels should read Monstress. (And, of course, *Morpheus impression* no one can be told what Monstress is, they have to see it for themselves). I am, however, going to share my favourite moments, in as cryptic a manner as possible: Hyenas! Cell doors! Run Kippa! The wit of Master Ren! The fate of the boy with no hands! The monster will out! Oh my, a man with wings! Needing a wee! Unmasked! Tuya?! And of course, the lessons of Professor Tam Tam! And I’m going to implore you to find a copy of this and read it for yourself. 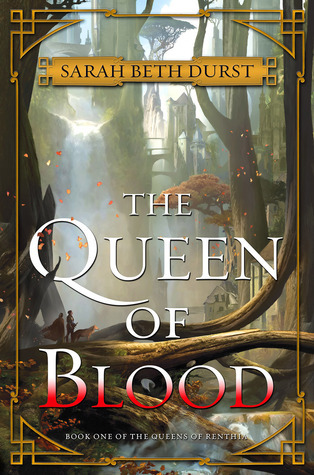 Read it for the incredible world-building, read it for what promises to be its epic story, read it for the infrequent light moments and for the dreadful darkness, read it for Maika Half Wolf, and read it for Kippa. The story isn’t always easy to follow, and the loveliness of Takeda’s illustrations often draws attention to the horrors of Liu’s storytelling, but it’s as rewarding as it is challenging and I can’t recommend it highly enough.